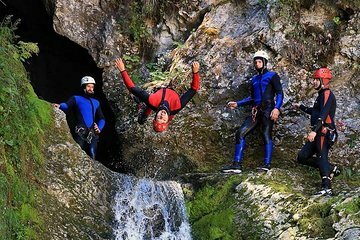 Passe uma manhã ou uma tarde conhecendo a região rochosa da Eslovênia em uma viagem de canyoning de meio dia para o Vale de Bohinj a partir de Bled. Com um guia certificado, dirija-se às águas cristalinas e canhões escondidos de Bohinj e passe horas explorando, caminhando, nadando, deslizando, rappel e muito mais. Sua excursão inclui todo o equipamento e orientação necessários para uma aventura segura. Nenhuma experiência exigida! We thoroughly enjoyed the humor and friendliness of our guide. He was an expert on navigating us safely through our canyoning tour. We had so much fun! I plan to bring friends back here in the future! Myself and three sons aged 14, 12 and 10 had a fantastic trip. Guides were excellent and fun too. hey will cater parts of the trip to suit you if you don't want to make the bigger jumps and drops. This tour was absolutely amazing! The instructor was really helpful and supportive if you didn't want to do the big jumps. We felt completely safe the whole day. Something we would 1000% recomend and do again. Great company which kept me up to date with weather conditions and water levels .. Picked me up on time.. And i was the only person so had Rok guide me.. He was fantastic and a great sense of humour.. Thoroughly enjoyed the experience. They actually do proper abseiling.. Other companies dont..